Yesterday I wrote a post about space-time, giving an example of how strange things can be when dealing with special relativity. If some of you have already read it, forgive me, for I wrote it at like 3 AM, and it had a few minor errors in it. My brain was tired because I struggled for hours to get Latex working in my posts (it allows you to put math equations in blog posts). Earlier today I went back and read over that post and thought, “Woah, that ain’t right.” So if it confused you the first time, check it out again and see if it makes a little more sense now. I have to remember that after I click “publish” on this site, it also emails it out to everyone on my list as well, and some of you get my posts that way. I need to wait until the next day after I’m rested, and make sure I didn’t make any mistakes! For the next couple of days I want to make some posts regarding reference frames and explore the strange things that happen when you accelerate relative to someone else. You’ve probably heard about Einstein’s relativity theory, and one of its main premises is that the speed of light is constant, regardless of how you’re moving. It’s the same in each and every reference frame. Let’s move slowly and explore the implications of an idea like that, and see how it works. We’ll take a very simple example of how events can happen at different times in different reference frames, going very very slowly, and dissecting the situation in detail. 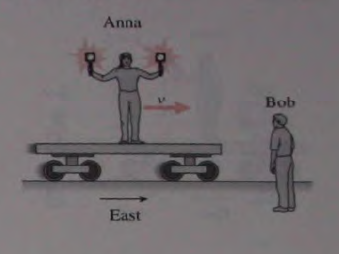 We’ll begin by assuming we’re a woman named Anna, and we have two lamps in our hands which each have a button on them. If we press that button, the lamps emit a strong flash of light. 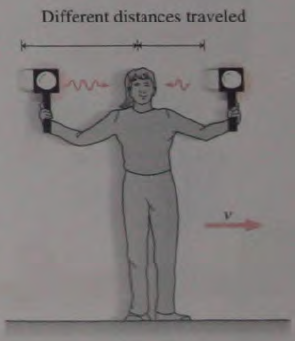 Let’s hold up our lamps, one to the left, one to the right, both an equal distance from our head. Now we’ll hit the buttons on each lamp at the exact same time. What happens? In order to avoid any weird confusions, let’s assume that our brain is infinitely fast and that we’re aware of everything going on around us, and we do not depend on sensory organs to get information about the world. We don’t need eyes or ears, but we can just perceive what’s going on around us because we’re directly tapped into the space-time fabric. In order to perceive the lamps we’re holding in front of us, we don’t have to wait for light to bounce off of them and fall on our eyes. We simply feel and sense the distortion in the space-time fabric which they make. We can also directly sense and feel the electro-magnetic waves of light pulsing through the space. We’re kind of like a puppet master, where small strings are connected to each and every point in space, but our strings aren’t normal strings. They feel every tiny vibration, no matter how small, and we don’t have to wait for the wave to propagate up the string to us in order to sense it. The instant anything happens to those strings, any change or anything at all, we know about it. I could use the analogy of a spider on the space-time web, but I don’t want to be a spider. Alright, we’re fully connected and aware of everything. This connection to our web is an analogy for a reference frame. Our equations for a reference frame will represent those strings to each and every point around us. The moment we press the buttons we sense the electricity pulsing through each lamp and then the lamps themselves light up. Both emit electro-magnetic vibrations (the light waves), and we sense them moving through the space-time fabic, vibrating through each point in space toward us, both from our left side and our right side. The two waves travel through space at the speed of light (299,792,458 meters per second), and in a very very short time period they each connect with our left and right cheeks at exactly the same time. So far everything is going as expected. We’re beginning to feel adventurous. We invite our friend Bob to join us, and he also possess this “spider” like ability to sense everything going on around him as well, connected to each and every point of space-time in his reference frame. We decide to climb up on a moving train car which is moving to the east relative to Bob. As we climb up on the train car, we notice some amazing things happening. As the friction between our shoes and the train car applies a force on our body, accelerating us faster and faster, we feel ourselves being “disconnected” from our web of space-time strings, and we’re being connected to a new set of strings. Every instant in time we’re being connected to a new set of strings until eventually our body reaches the same velocity as the train car and then things stabilize. We’re now connected to a brand new set of strings. We’ve entered a new reference frame. Whew. That made us dizzy for a second. We notice that Bob has become thinner in the direction we’re moving. His length has been contracted in the direction of motion of the train car. In this case, he’s less wide and looks like a skinny bean pole. We further notice that the electricity pulsing through his brain is moving slower than it was before we hopped on the train car. We now decide to do the same experiment we did before with our lamps. We hold them out to our left and right and press the buttons. What do you think happens? You might guess this. Let’s say our train car is moving 75% the speed of light. That’s pretty darn fast. 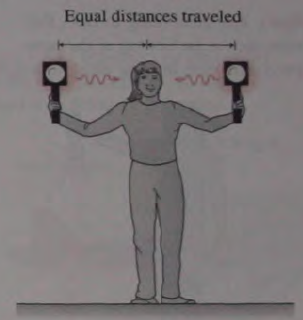 You might expect that because we’re moving so fast, the light wave coming out of our right-hand lamp would have to chase our moving body, whereas the other light wave coming from the lamp in our left-hand would come at us faster. The light wave from the left-hand lamp should hit our cheek before the right-hand lamp. As strange as this may seem, that’s not what happens in reality. In real life, you’d press the buttons and we’d have the same experience as when we were on the ground – both waves strike our cheeks at exactly the same time. So wait a minute. Does light ignore the fact that we’re moving? Sort of, but it’s a bit more subtle than that. The speed of light will be the same for any reference frame. As the spider-like puppet-master watching that electro-magnetic vibration pulse through space along one of our strings, we’ll always, ALWAYS, sense it moving at the speed of light. Ok, but what about Bob? He’s connected to space-time in his reference frame which is different from ours. We left him on the ground. How does this all work for him? Well he watched us climb up on the train car and saw our body become tall and skinny like his did for us! In his frame of reference, our body contracted in the direction of the train’s motion. Also, he notices that the electricity pulsing through our brains is moving more slowly than his own. So what about the lamps and the light beams we fired at our cheeks? What does he perceive to happen? Well we know that the speed of those light waves has to travel at the speed of light for him, just as they do for us. He sees those same light waves, but they’re traveling through a different space (down different strings). That’s one of the main assumptions of Einstein’s theory of relativity. It’s really weird, but it’s how it works. But this leaves us with a problem. To Bob, we’re moving at 75% the speed of light to the East. In his reference frame, the light pulse has to chase us down to catch up with our motion, just like in the third picture. So what happens? What’s the solution to this? Bob doesn’t see us press the buttons at the same time. To him, we pressed the button in our right hand first, and then pressed the left-hand button a bit later. To Bob, it looks like we timed it to where we’d fire the right-hand button a little early so that both waves will hit our cheeks at the same time. And that’s exactly what happens. The light waves do hit our cheeks at the same time in Bob’s frame as well, but the light pulses were not fired from the lamps at the same time. The right-hand light wave had to travel further and was emitted earlier. Light is a pretty amazing phenomenon. It seems to be a sort of four-dimensional vibration. At least that’s how I understand it, but I have a lot to learn. In my next post, I want to talk about the Lorentz contraction and time dilation, showing how things don’t have a set size or shape. Until next time! Next Next post: Onward To The Edge!